"If this thing is not fixed today, the president ... better go in and completely take over," Sen. Bill Nelson says. (CNN) -- Lawmakers increasingly frustrated with the pace of response to the oil spill in the Gulf of Mexico are calling on President Obama to take charge of the situation,­ and soon. 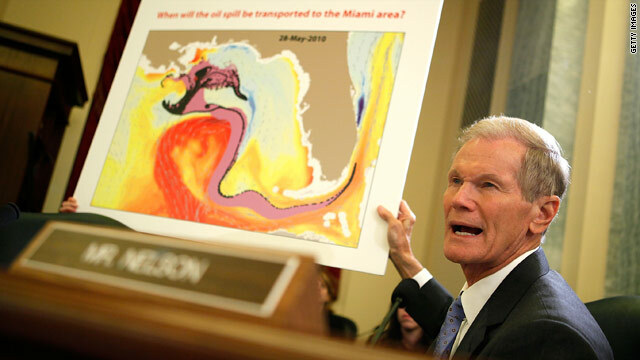 Sen. Bill Nelson, D-Florida, warned that if BP's latest attempt to stop the oil spill is unsuccessful, the president must step up and seize control of the increasingly dire problem. "If this thing is not fixed today, the president doesn't have any choice and he better go in and completely take over, perhaps with the military in charge," Nelson said Wednesday in an interview with CNN. Secretary of the Interior Ken Salazar promised the government would continue to put pressure on BP to solve the problem. "We will keep our boot on their neck until the job gets done," Salazar said Tuesday. But some lawmakers are wondering ­ just how long that is going to take. A month after the oil rig explosion that started it all, and several attempted solutions later, a rig is still gushing oil at an estimated rate of at least 5,000 barrels a day. Some estimates are far higher. "The perception is that we're fumbling around," Nelson said. "I am sure that BP wants to get this plugged as quick as anybody, but it hasn't worked." And that's why Nelson thinks it is time for a structure to be put into place to finish the job. "The military has an apparatus, the organization by which it can bring together the civilian agencies of government and get this thing done," said Nelson. Nelson's comments reflect a growing sense among members of Congress --­ even in the president's own party -- that the administration has not done enough to stop the spill and quell the damage. West Virginia Democratic Rep. Nick Rahall said the president must show a more "take-charge attitude." "I'd like to see more," Rahall said. "It doesn't take a rocket scientist to figure out there are some frustrations there." Moderate Republican Olympia Snowe of Maine voiced similar sentiments regarding the structure of who is overseeing the disaster response and cleanup. She told reporters it's not "practically apparent at all that there is any single person in charge at any level." "I think it requires the president of the United States' amassing all the federal resources to help the governors in those respective states and to make sure this oil spill is contained and solved," said Snowe, "and getting all the people in the room and not just leaving it to BP -- sort of a trial-and-error approach every day. And you've got to understand who is doing what." Nelson, who has been a longtime ardent critic of BP, also said there must be immediate changes at the Minerals Management Service, the agency that oversees oil drilling. It has come under fire for mismanagement and cozy relationships with industry officials. A report from the Interior Department's inspector general found that inspectors in the Minerals Management Service accepted meals and tickets to sporting events, such as the 2005 Chick-fil-A Peach Bowl game, from companies they monitored. "I think the president is going to have to have Secretary Salazar clean house in the Minerals Management Service," said Nelson, who accused the agency of letting the oil industry "rule the roost." Salazar, who has ordered a widespread shakeup of the agency since the oil spill, called the report "yet another reason to clean house." iReport: Obama critics "miss the point"
On Wednesday Nelson announced he is filing legislation requiring federal oil industry regulators to wait at least two years after leaving government service before going to work for companies they helped regulate.